The title of the process can be entered here; this will be used to identify the process in the Portal Manager. You can also enter a short description for the process. Opens the respective dialog where the Title or Description can be defined in the different portal languages. The current version number is shown here. Opens a dialog where the version number can be defined. With this setting, the process will run independent from the permissions of the user who started the process. When the setting is deactivated, the permissions of the user will be regarded for the data access. With this setting, multiple instances of the same process can be run at the same time (such as simultaneous timer or data group actions). Please only change this setting if the application case makes this necessary, and that by blocking parallel execution, undesirable effects like deadlocks can be avoided. Specifies the time in seconds that a process may take. If Groovy script is used, the setting only takes effect if checks for interruption requests occur in the script. As long as the workflow engine has control, it checks whether the timeout has been exceeded. Calling "checkInterrupted()" is recommended in Groovy scripts that have a long running time, since in this case the workflow engine has handed off execution to the script. Reduces the recording of process steps in the log file of the process to warnings and errors. Only activate this setting if you are certain that the process will function without restrictions for a long time. A restricted log can make the search for errors more difficult, as it will not be visible in certain circumstances to reconstruct which process steps occurred before and after an error. 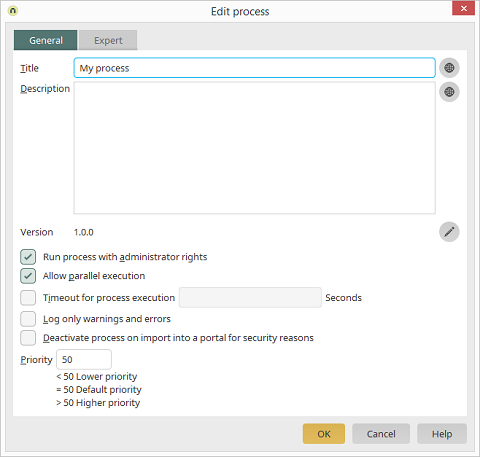 When elements like the timer are contained in processes that lead to undesirable changes (such as data group actions) after importing the process into another portal, select the "Deactivate process on import into a portal for security reasons" setting to prevent the process from running. The setting is enabled automatically if the wizard to create a new process is used and a time-controlled process is created. It can be optionally selected from a question box when a new event source is created and first configured, and the setting has not yet been enabled for the current process. Here, you can enter an integer to define the priority of the process. Processes can be allocated a priority that determines the order that they will be executed in, in situations where several processes are responsible for a particular event. The value is set by default to 50; higher values have higher priority, and lower values, lower priority.